According to this video, we have the Oracle of Delphi to thank for directing the Greeks to settle in Italy almost 3,000 years ago. Although it’s a fairly long (26 minutes) video, I found it very interesting. I hope you do too! In the early 1700s, porcelain produced at Meissen became all the rage in Europe. The King of Naples and Sicily, Charles VII, married Maria Amalia, whose grandfather Augustus II of Poland had founded the Meissen factory, the first hard-paste porcelain factory in Europe. 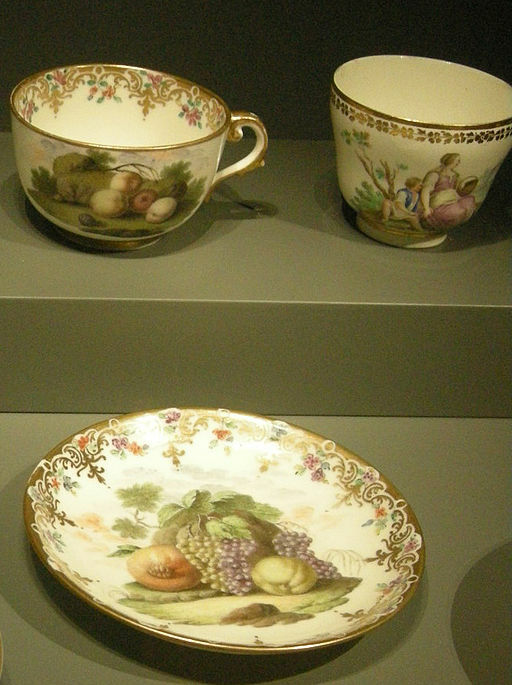 18th c. Capodimonte porcelain examples from the National Gallery of Victoria (Australia). Photo: by Sailko, from Wikimedia Commons. Pursuing his interest in the art, Charles VII founded the Capodimonte (top of the mountain) Porcelain factory in Naples in 1743. Production was well under way when Charles’ father, the King of Spain, died in 1759 and Charles took the Spanish throne and left the throne of Naples to his son Ferdinand. Before he left, however, he ordered the porcelain works demolished, and took the molds with him to Spain to found another factory there. 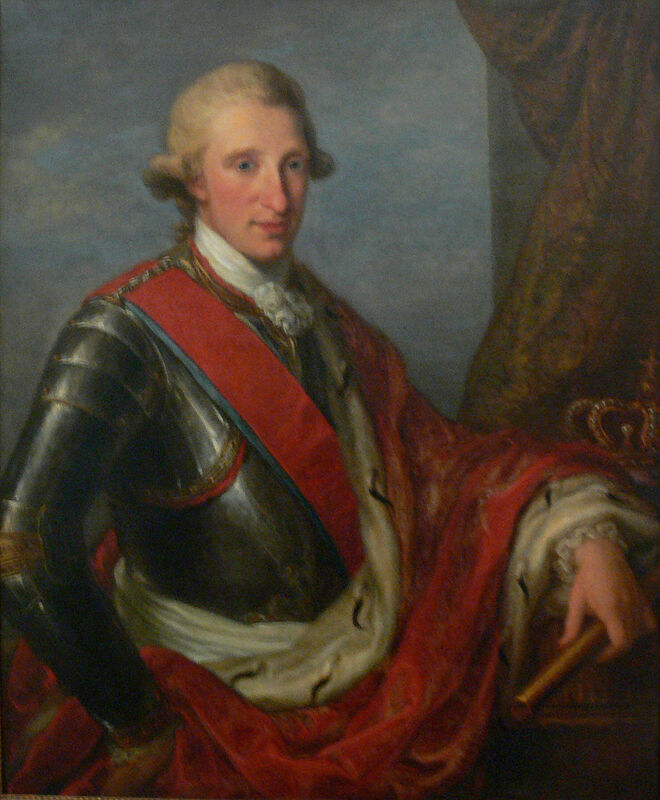 Ferdinand IV wasn’t so easily dissuaded–he had come to appreciate the porcelain art himself, and re-established the Capodimonte factory in 1772. 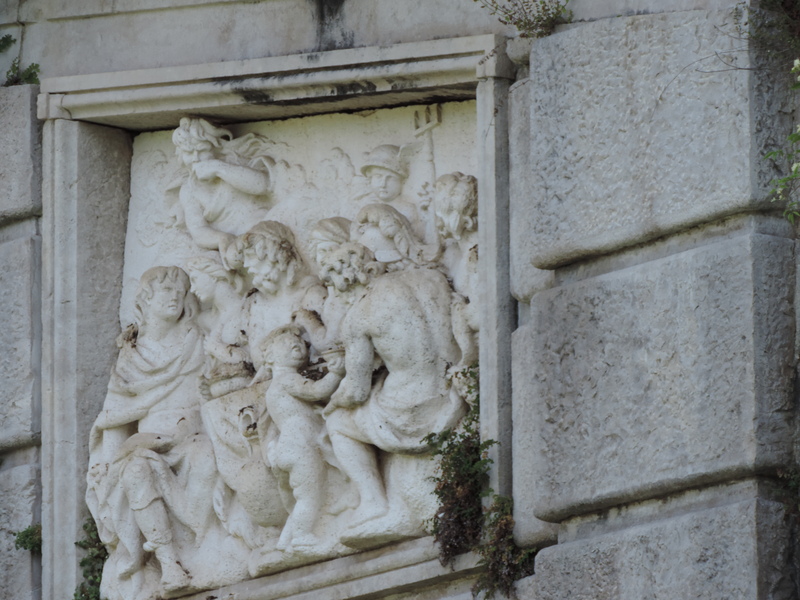 The detailed history (some found here) is more complex and involved a lot of experimentation with the porcelain “recipe”, hiring of various artists, chemists, directors, and so forth, and the establishment in Naples of an art academy. 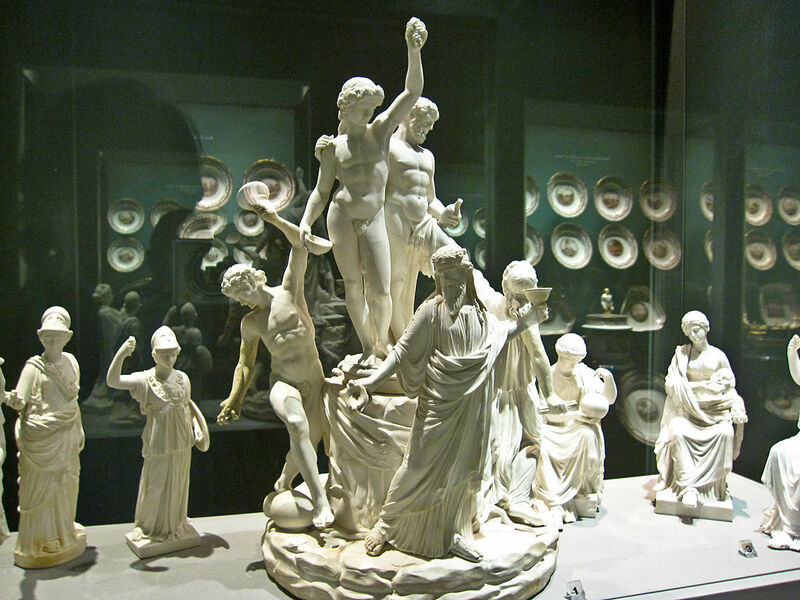 Elaborate bisque figures, “The Triumph of Bacchus” from the Capodimonte Museum in Naples. Image from Wikimedia Commons. Ferdinand was soon embroiled in Napoleon’s schemes for Italy, (I’ve posted about that before) and production of the royal sponsored Capodimonte porcelain ceased around 1818. The factory was purchased by Claudio Guillard and Giovanni Tourne, who continued to used the same mark as the royal factory. In 1834 the company was purchased by a Florentine, and about 1896 they combined interests with the Societa Ceramica Richard of Milan. 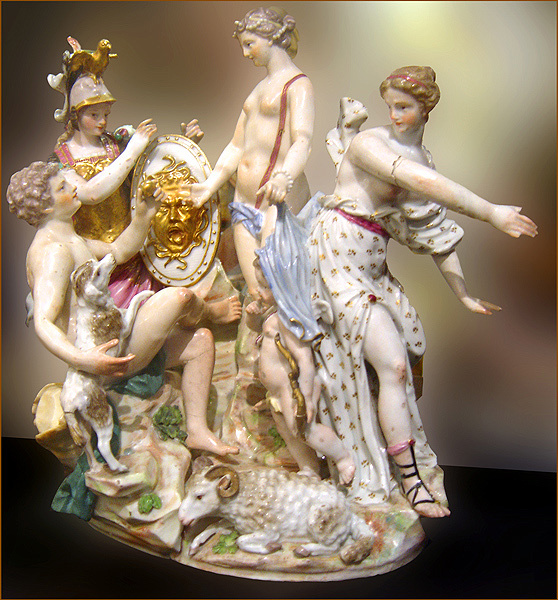 They continue to produce porcelain in the Capodimonte style, and the style is widely copied today. The Judgement of Paris, now in the Capitoline Museum in Rome. Colorful and elaborate figures typically linked with Capodimonte style. Image from Wikimedia Commons. Most of the 18th century products are in museums or collections of the wealthy today. Are you interested in buying some later pieces? Here are some listing from Ebay.com. Some claim to be 19th century pieces, and others are newer. QUESTION: What is your favorite art or craft from southern Italy? Please comment! 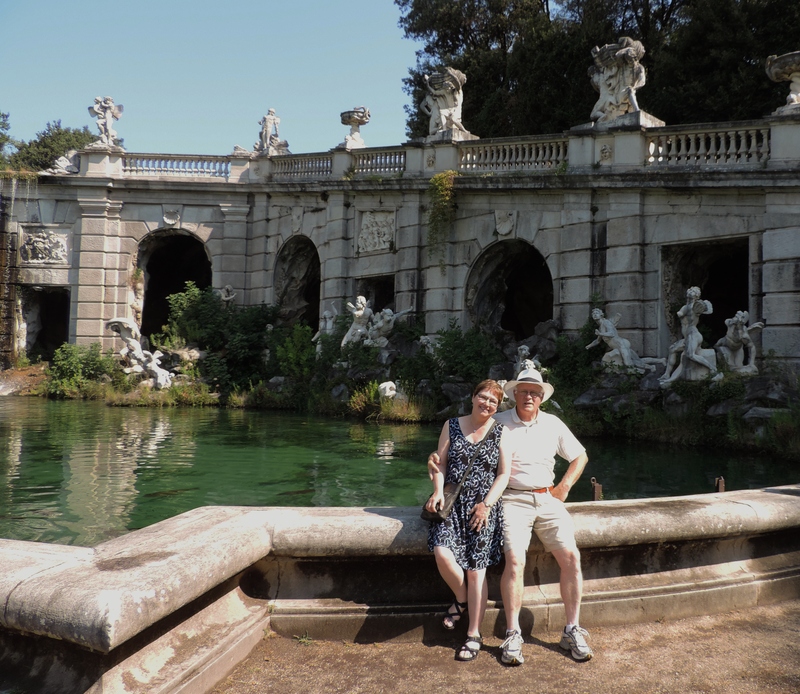 I have yet to visit Sicily, though a couple of my favorite books about Italy take place there. (See the book reviews here and here.) 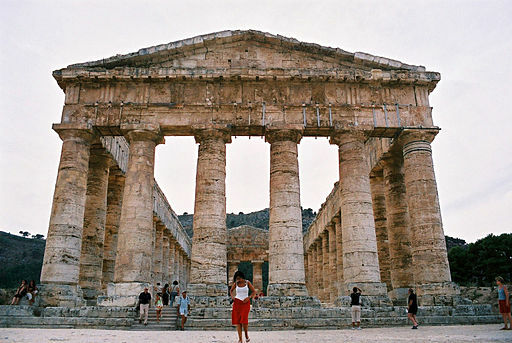 Today I’m sharing another writer’s experience visiting one of Sicily’s premier ancient sites, the Greek temple at Segesta. The ancient Greek temple at Segesta. Image from Wikimedia Commons. Honestly, I just read about Segesta in another book yesterday. I was reading aloud to my mother as we sat in the car, waiting in line for a ferry across Puget Sound. Then I saw that the Sicilian Housewife has a guest post about a visit to Segesta, along with wonderful photos. The journey to Segesta is as entertaining as the photos. So sit back and enjoy a mini trip to Sicily today! Just click here. Napoleon certainly made his way around Europe, and he didn’t pass up the Kingdom of Naples. The Napoleonic Wars began in 1789. Ferdinand’s wife, Maria Carolina, was a sister of Marie Antoinette, and Ferdinand himself was a first cousin of the French king, Louis the umpteenth. When the French monarchs were executed in 1793, Ferdinand joined the First Coalition, and alliance of European monarchies opposed to Napoleon and revolutionary France. Despite the efforts of the alliance, by 1798 the French were in control of the northern part of the Italian peninsula, including Venice and parts of the Balkan coast of the Adriatic. King Ferdinand I of the Two Sicilies, III of Sicily, and IV of Naples–as you wish. I am not a student of the Napoleonic era, and I’ll probably continue to find the chain of events confusing unless I really devote some time to it. Ferdinand, the King of Naples, is confusing enough on his own. His full Italian name is Ferdinando Antonio Pasquale Giovanni Nepomuceno Serafino Gennaro Benedetto. He is called Ferdinand IV as king of Naples, but Ferdinand III as King of Sicily, which he ruled at the same time. And after the defeat of Napoleon in 1816, he was known as Ferdinand I, King of the Two Sicilies (the island and the mainland, which had been called the Kingdom of Sicily in earlier times). With the French troops occupying Rome, in late 1798 Ferdinand took an army north to oppose them. He was far outmatched, and his Roman foray is summed up in the saying, “He came, he saw, he fled.” He went back to Naples, and shortly departed for Sicily (of which he was also king). Out of the anarchy that followed his departure, on January 23, 1799 the Parthenopaean Republic was proclaimed. Supported by the nobles and the wealthy middle classes, the Republic was strongly opposed by the peasantry, who fought valiantly for their king. Within a few weeks, the French military was recalled to northern Italy, and Ferdinand immediately began planning to retake his mainland kingdom. An army led by Cardinal Ruffo was formed in Calabria and marched north, reaching Naples on June 13. After eleven days of fighting, a tentative capitulation was being considered, when Admiral Nelson’s fleet arrived in support of the king. By the end of June the Republicans were routed, mostly arrested, and on July 8, King Ferdinand resumed his throne in Naples. 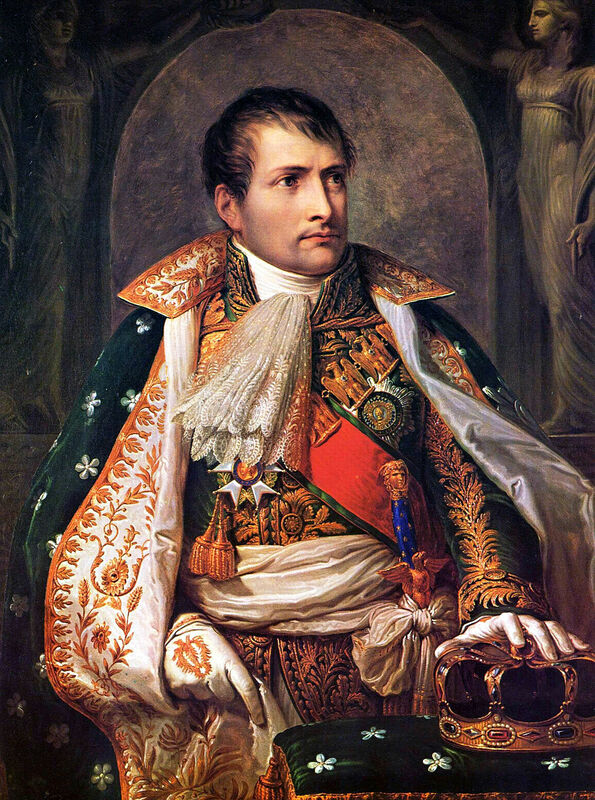 The Parthenopaean Republic’s demise was not the end of Napoleon. But that’s a story for next month’s history post. THIS LINK will take you to a fantastic interactive map on the Napoleonic Wars. In family history, every answer, every discovery, prompts a new question or search. My great-grandfather, Francesco Aruri, was born in Serra di Piro, and “frazione” or hamlet near Bianchi, Calabria, in 1846. Here is a summary of the recorded information about his birth: The birth of Francesco Arcuri was filed on 1 August 1846 in Bianchi by his father, Pasquale Arcuri, age 47, a peasant farmer residing in Bianchi. His infant son was born at home in the Serra di Piro District, on this day to his wife, Maria Innocenza Perri, age 35, and was given the name Francesco. Francesco Arcuri was baptized on 1 August by the parish priest of the Church of San Giacomo, in Bianchi. 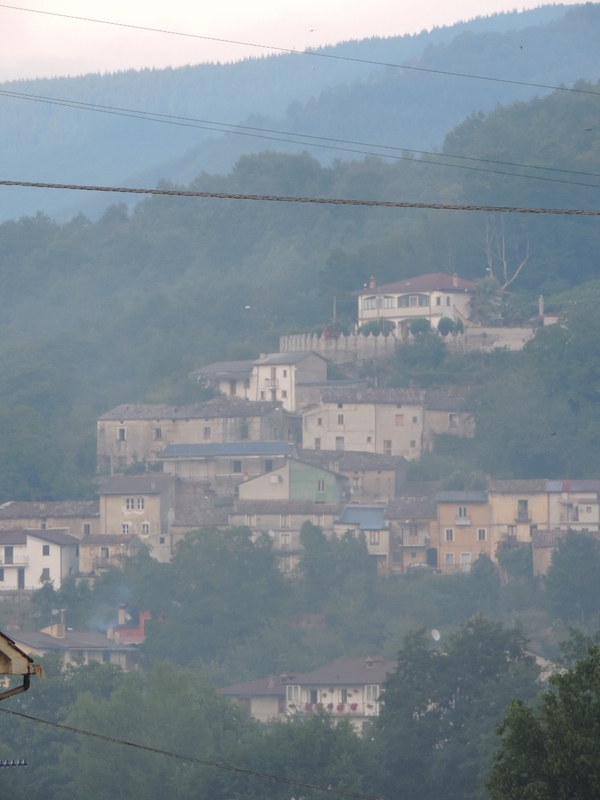 The Serra di Piro district near Bianchi. I found the Serra di Piro area on Google maps. 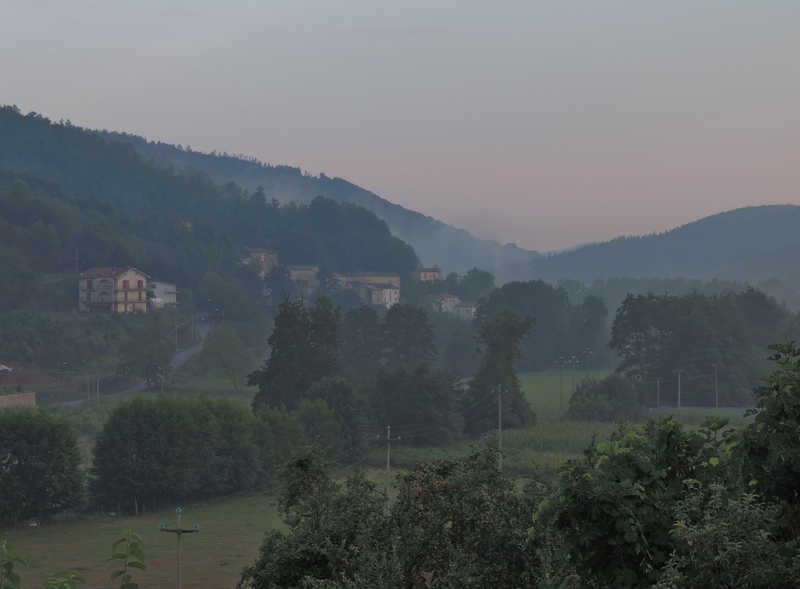 It is just north of Bianchi a mile or two, and very close to Palinudo, where Pasquale Arcuri was born. 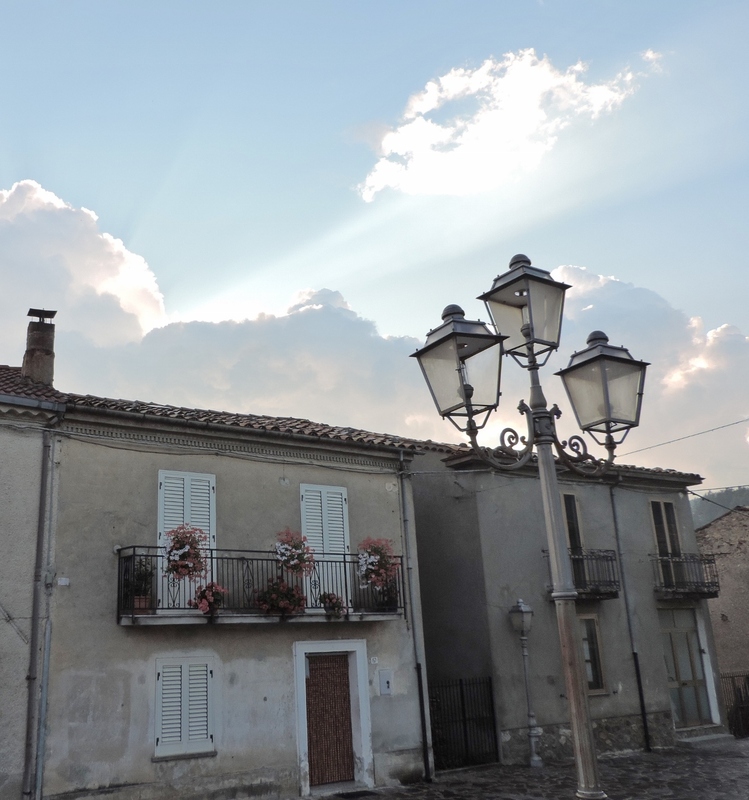 The records say: The marriage of Pasquale Arcuri and Maria Innocenza Perri was filed on 31 August 1830, in Bianchi. The groom was 26 years old, a peasant farmer born and residing in Palinudo. 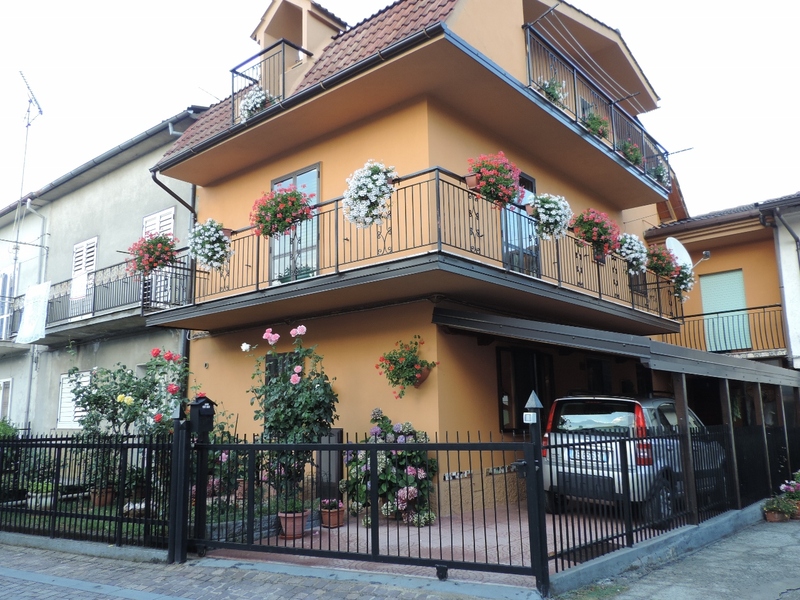 He was the son of Giacomo Arcuri, a peasant farmer residing in Palinudo, and Saveria Mancuso, residing here. The bride was 28 years old, born and residing in Bianchi in the Serra di Piro District. She was the daughter of the late Francesco Perri, a peasant farmer, and the living Concetta Cosco. The couple was wed on 3 October in the parish of San Giacomo, in Bianchi. 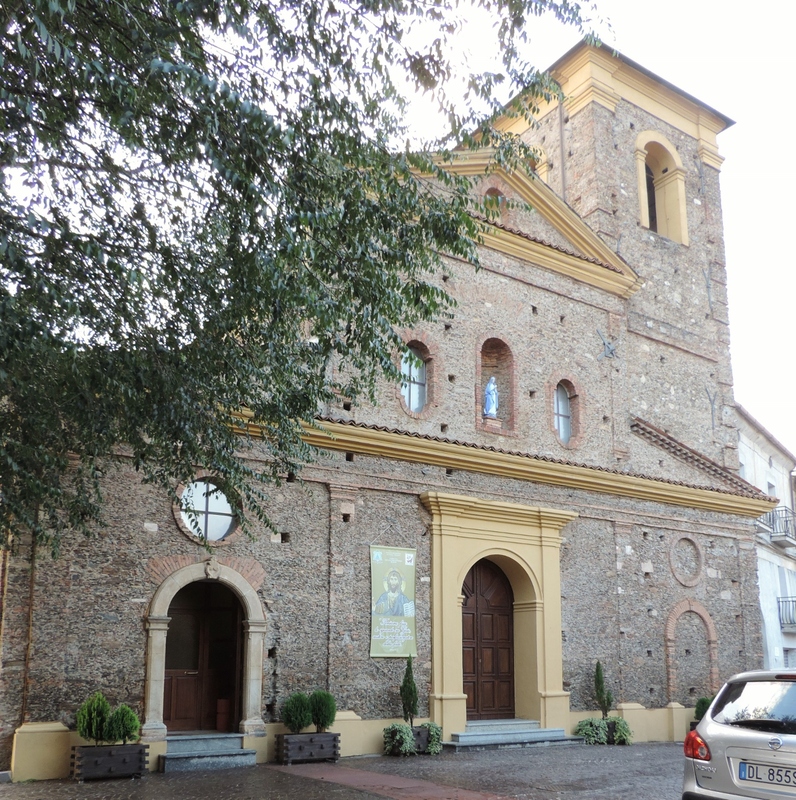 San Giacomo church, where Francesco Arcuri was baptized, and where his parents were married. So Francesco’s father, and both his grandfathers, were peasant farmers in little hamlets in the foothills of the Sila. What does “peasant farmer” suggest? I headed to Palinudo with that question in mind–would we find a group of huts along a dirt track? Scattered houses among hillside vegetable terraces? Both of Francesco’s grandmothers were cotton spinners. What kind of textile industry supported their work? Who paid them? How far away were the weavers who used their cotton, and what did they make from it? Was the cotton also grown nearby? A simple home in Palinudo. Of course, more than 150 years has passed since those descriptions were written in Bianchi’s town records. 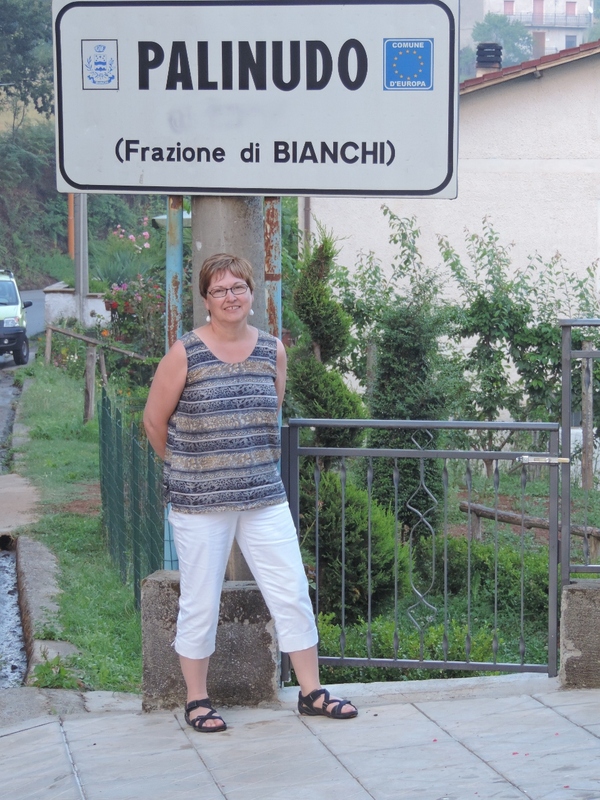 And whatever Palinudo was in the 1840’s, it is now a small but thriving ‘suburb’ of the town of Bianchi. In the half-hour or so we spent there, I saw a Mercedes, a BMW, even a Jag. The roads were paved (not fancy, but paved). There is a small, but rather desolate, church in the hamlet. I wonder if it was desolate even in 1846–is that why Francesco was baptized in Bianchi? What were the options and factors that went into the decision about where to baptize a child? One of Palinudo’s nicer homes. All too soon after Francesco’s birth, this death was recorded: The death of Pasquale Arcuri was filed on 2 October 1846, in Bianchi by Emiliano Arcuri, brother of the deceased, age 22, a peasant farmer, and Carmine Mancuso, brother-in-law of the deceased, age 28, a peasant farmer, resident of the Serra di Piro District of Bianchi. Pasquale Arcuri, a peasant farmer, died at home in the Fiume Corace District on 1 October, at the age of 40. He was born in the Palinudo District, the son of Giacomo Arcuri, a peasant farmer, and Saveria Mancuso, both deceased, and was a resident of Serra di Piro. Pasquale was married to Maria Innocenza Perri. At two months old, Francesco was left fatherless, and all his grandparents were already deceased. What did an widowed mother of an infant do to support herself? Various other family members are named. Maria Innocenza Perri had a brother who was living when their mother died in 1831. Was he still alive? Did her late husband’s family help her? Did she remarry? The Sila foothills around Bianchi. Even the most detailed historical study won’t likely help me fully understand the lives of these ancestors. I may have to resort to fiction to make their stories come alive. 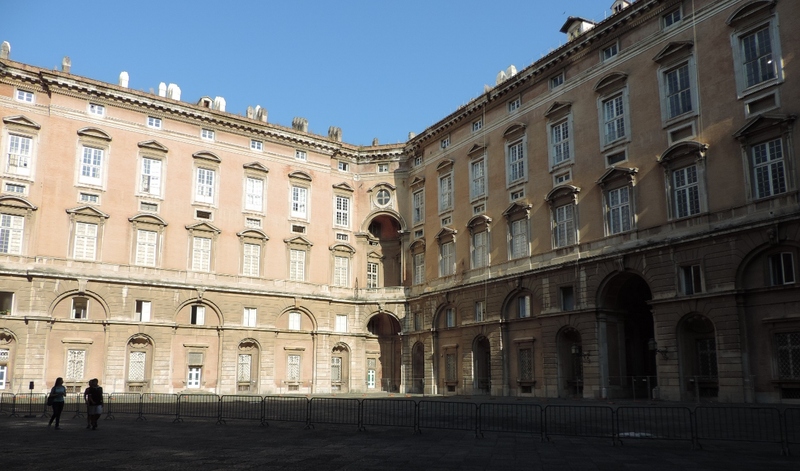 In the 1750s King Charles VII of Naples determined to build a royal palace that would outdo Versailles in beauty and grandeur. He chose the architect, Luigi Vanvitelli to make that goal a reality. The result is a 1200-room marvel of a palace, in fact the largest royal palace in the world, by volume. Each of the four inner courtyards is nearly an acre in size. A waterfall along the long watercourse behind the palace. I had read reviews of visitors who complained that the interior which is available to tour was just empty rooms deteriorating in the heat. That was not my experience. Period furniture and artworks were in most of the rooms on our tour–though no interior photography was permitted. The tour covers a small fraction of the palace. Some areas are used for offices of government agencies. I believe most of the palace is unoccupied. The exterior is perhaps even more of an attraction than the palace itself. A dramatic waterway forms the centerline for a series of parks and gardens. For the rest, my photos will speak for me. One of the four massive courtyards inside the royal palace. 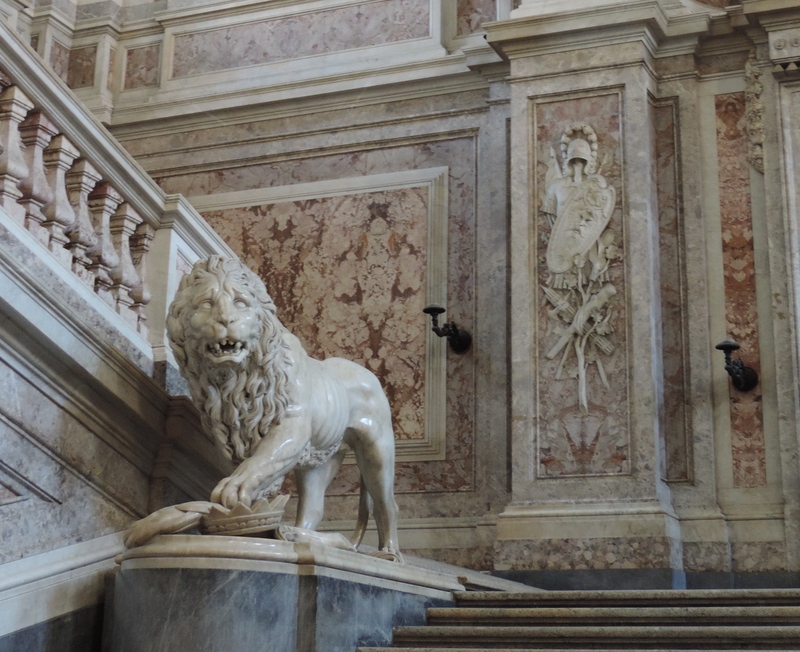 This spectacular staircase leads to the “piano nobile”, the floor containing the royal apartments. 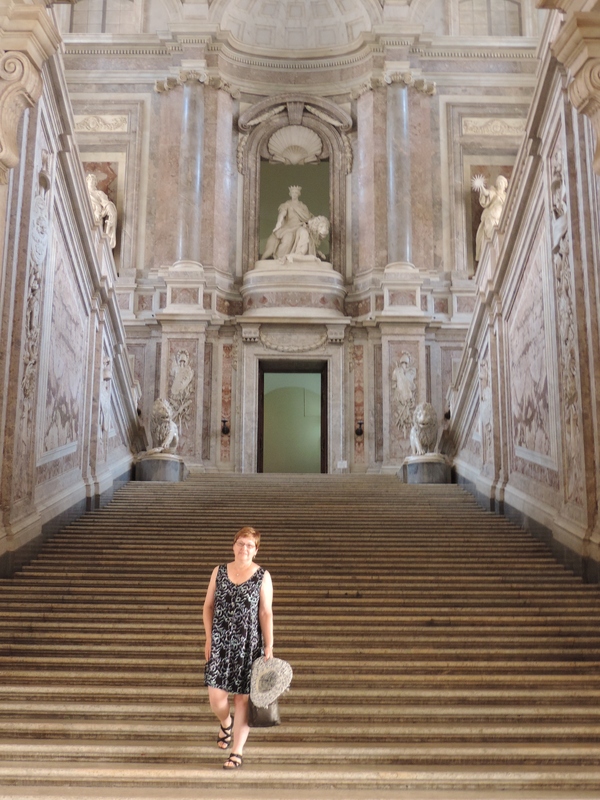 In the film ‘Angels and Demons’ this staircase was used for a scene set at the Vatican. A little more stairway detail. 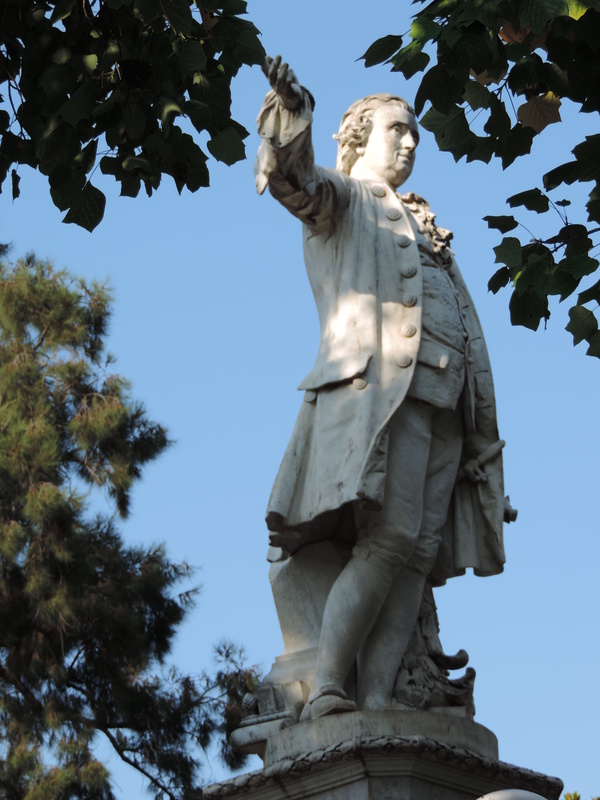 Luigi Vanvitelli’s statue stands in a park named for him, in the town of Caserta, a few blocks from the palace he designed. The abbey built by “my” pope! I spent several years researching Pope Celestine V, and wrote a novel in which he was a significant character. Don’t bother looking at Amazon–it remains unpublished. One of the most exciting days during my research in Italy was visiting the Abbey of the Holy Spirit, which was founded by Pope Celestine in the late 1200s. At the time of our visit, nine years ago, the abbey was in the middle of an extensive renovation, and was closed to the public. 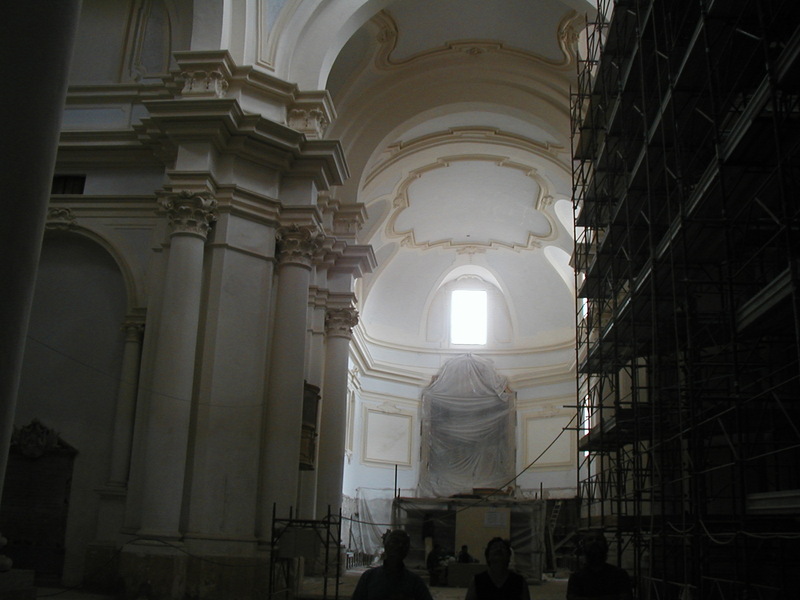 However, with the help of an Italian friend, I was given a tour guided by the architect who had worked on the restoration from its beginning. At that time, we picked our way through construction debris and materials, plastic draping, and electrical cords. The paintings on the walls were just emerging as a blanket of grime was removed. But most meaningful to me was a visit to the crypt–probably the oldest section of the abbey, because much of the existing construction was done after a devastating earthquake in the early 1700s. Long strings of construction lights left shadowy corners in the crypt, and dust from the restoration work covered the floor. The architect pointed out a fresco picturing the future pope, Peter of Morrone, with a group of monks. I noticed a large panel of concrete in the floor with an iron ring set into it. When I asked what it was, the architect and my friend placed an iron bar through the ring and lifted the panel to one side. We peered in, but the poor lighting revealed nothing. Then my husband aimed his camera down the hole, and the flash went off. The resulting photo is my favorite of our travels, an image that awes me to this day. We were looking into the ossuary, the place where monks’ bones were laid to rest. 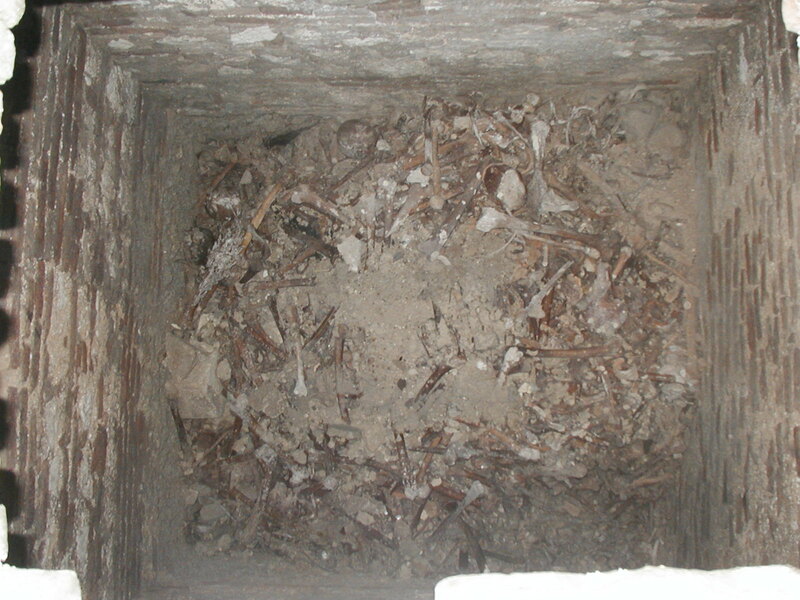 Amidst the dust, the human bones are visible, bones of men who served God hundreds of years ago. The monastery was closed more than 200 years ago, so the remains we saw were from the 18th century and earlier. Today, the restoration is done, and the results are beautiful! Here is a video tour, narrated in English, of the Abbey and a couple of other nearby sites. Have you visited a monastery? Is there a particular one whose history intrigues you? Tell us about it in the comments!